Capitol Police arrested a member of Bell Visuals, a group famous for projecting anti-Trump statements on Trump Hotel. WASHINGTON — Visual artist Robin Bell first captured President Trump's attention when he projected the words, "Experts agree: Trump is a Pig," on the facade of Trump Hotel on Pennsylvania Avenue. His latest projection captured the attention of U.S. Capitol Police, when officers arrested one of Bell's associates within sight of the Capitol Wednesday evening. 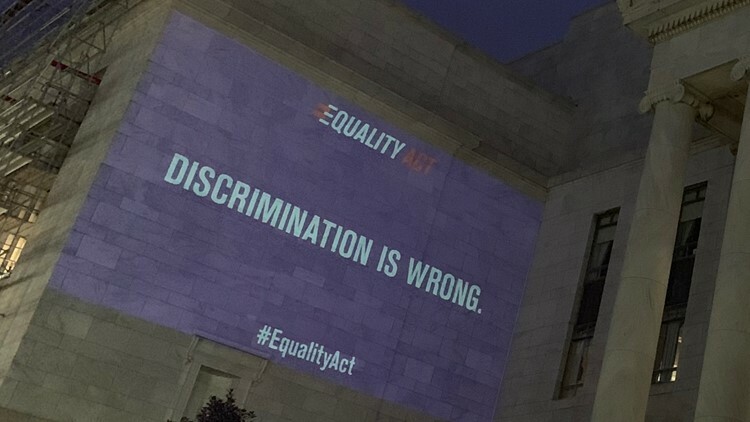 The image displayed on the front of the Rayburn House Office Building read, "Discrimination is wrong, #EqualityAct." U.S. Capitol Police arrest a man working for anti-Trump artist Robin Bell. Bell is known for projecting critical statements about President Trump on the facade of Trump Hotel in Washington. Authorities confiscated the artists projection equipment, with cell phone video showing police loading a projector into the back of a flat-bed truck. The suspect was cited and eventually released from police custody a few hours later. Bell, who has previously displayed images onto the Trump Hotel and Department of Justice building, said his crew displayed the Rayburn image to bring attention to the Equality Act proposal in Congress. "Something like that is not controversial or arrest worthy,” he said. Bell said this was the first time he had ever experienced an arrest in his eight years of projecting images onto DC buildings. He said a couple of police officers had walked by his group while they were projecting the images before a USCP officer arrived on scene to stop the display. “We had a sergeant who just arrived, very hot, and was like 'This is the law. The law has changed,’" Bell said. Bell questioned exactly what law had changed. “If we had known that there had been any change, we would have acted accordingly,” he said. Malecki said no recent change had occurred to the laws surrounding demonstrations on Capitol Grounds. The USCP’s guidelines for conducting an event on Capitol Grounds dictates that demonstrations are prohibited from taking inside of any congressional buildings, on the steps of any building on Capitol Grounds or areas identified as “prohibited areas” in the United States Capitol Grounds Demonstration Areas Map. That map shows that demonstrations are not permitted within the Rayburn Building or its steps. However, it is not clear about demonstrations that originate from the sidewalks that surround the building. The map only states “the pedestrian walkway must not be impeded at any time”. Bell said his group had projected their display from the sidewalk. But, he said he was also bothered by a police act he felt may have encroached on his group’s right to free speech. "It's unacceptable to stifle free speech,” he said. Bell said he was told by USCP that they will not get their equipment back until April 17. “They are basically holding our equipment hostage,” he said.